On 19 February, the council’s contractor, Forest Traffic Services, commenced its annual clean-up of the A303 and A34 verges, laybys and slip roads within the borough. 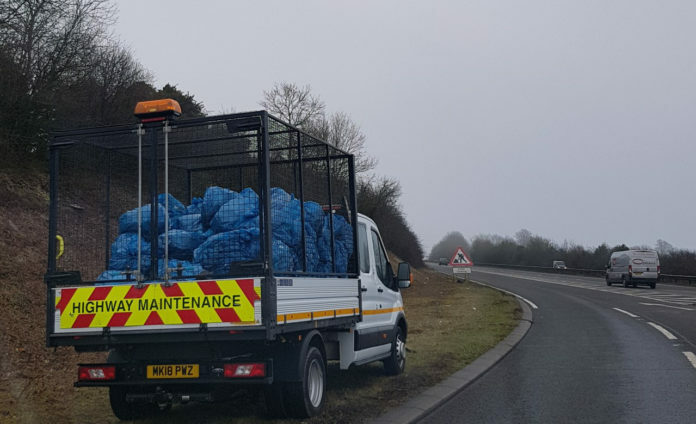 It took around three weeks to complete the work, with 634 bags of litter collected amounting to nearly 3 tonnes of litter and other roadside debris. The work is carried out between January and March each year, as the vegetation has died back, allowing for easier retrieval of litter. Environment Portfolio Holder, councillor Graham Stallard, said “Now the clean-up is complete, the difference is staggering. You can clearly see the improvements we have made from our before and after photos. I find it horrendous that in just one year, so much litter has been discarded along these two roads.